A spotting scope is a small and portable high-power telescope that has been modified for land or sea viewing during the daytime. Using a spotting scope, one can view across great distances and observe intricate details that are impossible to capture even through binoculars. 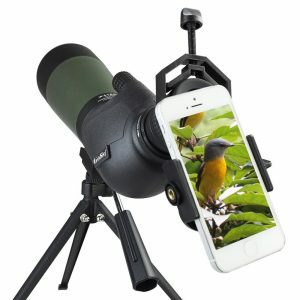 Addition of a spotting scope makes a huge difference in your observation and viewing experience during bird watching, hunting, ranging, nature observation, etc. 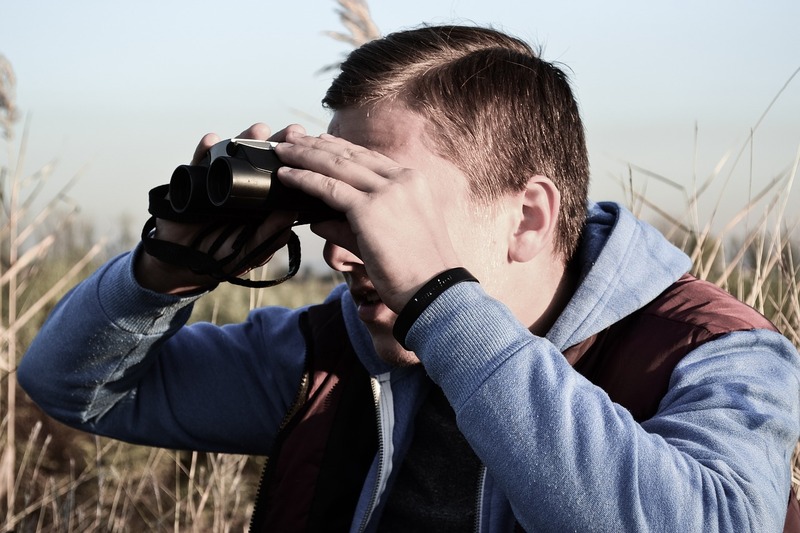 When you begin your research to find the best and most suitable long-range spotting scope, you may come across some technical terms which is why we have made a list of factors you must be aware of while choosing the best spotting scope for 1000 yards. Let us help you sift through some of the factors you need to consider while purchasing the best spotting scopes for 1000 yards. Magnifying power is an important factor to consider when purchasing a spotting scope. It is required because once you have located your object, you wish to examine your target as closely as possible. Higher magnifying power in a spotting scope will allow you to see objects which are at a considerable distance without distorting the clarity. Most of the spotting scopes have a variable magnification range between 15x and 60x. But for finding the best long-range spotting scope, the ideal magnification should be at least 16x. Objective Lens size determines the light transmission and retention rates of a spotting scope. The amount of light gathered and transmitted by the spotting scope which leads to brighter images and views, is directly proportional to the size of the Objective Lens size. So, with the increase in width of the objective lens, the images get crisper. The best long-range spotting scopes should have an objective lens diameter between 50 mm and 100 mm. To witness spectacular views, one needs to use a spotting scope with lenses made of best quality glass. Based on the degree to which the lens has been polished and the clarity of glass used, the overall quality is determined. Optical quality is very important to have the best viewing experience because it reduces the dispersion and reflection of light. 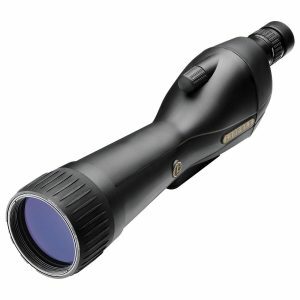 The best spotting scopes use lenses made with High Definition (HD), Extra-Low Dispersion (ED) glass. The lens coating is an important feature in a spotting scope because it significantly affects the optical quality and performance of the spotting scope. The lens needs to be coated properly to get rid of its irregularities and protect it from dust and scratches. This helps in preventing the diffraction and distortion of light. Further, anti-reflective coatings can be used to reduce the amount of reflection which ultimately helps in increasing the overall brightness. Also, lens coatings tend to smoothen the lens surface and make them easier to clean. One can even expect the use of phase corrective coatings for the optical elements used in a spotting scope. The best spotting scopes use fluorite-coated glass and fully multicoated optics. Those who wear spectacles should pay attention to the amount of eye relief offered by a long-range spotting scope. With a longer eye relief, eyeglass wearers can see a complete field of view because the optics are able to locate the focal point farther back behind the eyepiece. For a good spotting scope, an eye relief of 12-15 mm is suitable. The extent to which an object can be focused is referred to as close focus. It can be achieved either with a focusing collar or a focus knob incorporated into the spotting scope design. A spotting scope needs to durable enough to accompany you on several trips and excursions and provide you with the best optical experience. You must ensure that the spotting scopes have a strong and protective armor to make them suitable for rugged use. It is important for spotting scopes to be waterproof, fog proof and dust proof since they are an essential outdoor gear. This will allow you to continue using them even under harsh weather conditions. You can be assured of clear sights during rain, storm or cold weather. 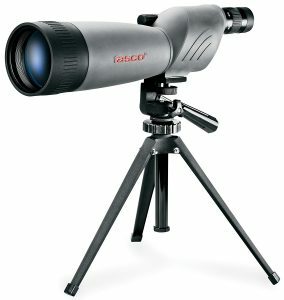 We have compiled a list of the best and most popular spotting scopes ideal for a distance of a 1000 yards. Vortex Optics Diamondback 20-60×80 Straight Spotting Scope is one of the most popular spotting scopes available on the market and can be considered the best spotting scope for not only 100 yards or 200 yards but also a 1000 yards. It provides spectacular optical quality at an affordable price. The use of fully multicoated lenses and phase corrective dielectric coating on the BAK-4 Porro prisms improve light transmission and overall image quality while the anti-reflective coatings reduce reflection, distortion, dispersion, etc. 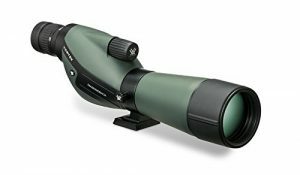 This model comes with a variable magnification range of 20-60x which makes it quite easy for the spotting scope to zoom in on the finest details of the target object. The 80 mm objective lens is a blissful addition to the list of features which significantly enhances the light gathering ability of the Vortex Diamondback Spotting Scope. This spotting scope comes in both straight and angled eyepiece design. The Straight Spotting Scope is pretty sleek and has an ergonomic design. The incorporation of O-ring seal into the design of this spotting scope prevents moisture and dust from penetrating inside the spotting scope and makes it waterproof, fog proof as well as dust proof. The BARSKA 30-90×90 Colorado Spotting Scope is one of the most powerful long-range spotting scopes on the market. The optical quality achieved by this spotting scope is superb and unmatchable. The image contrast is spectacular and makes your target object stand out from the rest of the image. The brightness, clarity, sharpness, and precision of the view achieved by the BARSKA Colorado Spotting Scope is exquisite and definitely sets some high standards for the rest of the long-range spotting scopes. The presence of O-ring seal and nitrogen filling in the design of this spotting scope makes it completely waterproof and fog proof. So you shouldn’t be scared to test this bad boy out in the harshest weather conditions and rugged terrains. The maximum magnification of 90x is astonishing and gives great results when combined with a 90 mm objective lens. Such a large objective lens improves the light gathering capacity of the spotting scope. This results in much brighter images and a better optical performance even in poor light conditions. 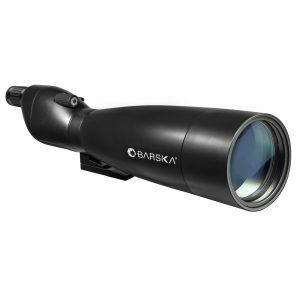 This BARSKA Spotting Scope can definitely be considered as one of the best spotting scopes for 1000 yards. Gosky 20-60×80 Porro Prism Spotting Scope is an all-weather spotting scope that can easily be touted as one of the best spotting scopes for 1000 yards. This spotting scope is able to provide you with crystal clear and bright views every time. This spotting scope includes fully multicoated optics with green film objective lens and high-quality Porro prisms to improve its light transmission ability and make your views bright, crisp and clear. The BAK-4 prisms make sure to reduce any kind of chromatic aberration. The variable magnification power of 20x to 60x and a dynamic focusing mechanism makes it easy for you to close in on your target object. The Tasco “World Class” 20-60×80 Spotting Scope is true to its name and provides a world-class experience. Its straight design is exceptional and durable as well. This particular spotting scope is fitted with high-quality optical components which ensure the visual clarity, sharpness, and brightness of the resulting image. Tasco World Class spotting scope is equipped with a variable magnification power of 20-60x which is super impressive and lets you zoom into a much greater level of detail in a target object. On top of that, it never lets a view get blurred due to the higher magnification. Also, it makes use of a pretty wide 80 mm objective lens which allows more light to be transmitted through the spotting scope and increase the overall brightness of the image. Additionally, this model of the spotting scope is completely waterproof and fog proof so you need not worry about rain, fog or any other kind of harsh weather. The world-class optics are fully multi-coated to provide you with a crystal clear view of your target. Also, the spotting scope is relatively more stable than its counterparts. The Tasco World Class Spotting Scope can definitely be considered one of the best spotting scopes for 1000 yards. Leupold has created a name for itself in the optics industry and has been known to deliver exceptional optical performance and viewing experience through their products. The Leupold SX-1 Ventana 2 Spotting Scope is one of their products which provides outstanding image performance and optical quality while maintaining its pocket-friendly price. Due to the presence of a large 80 mm objective lens, this spotting scope possesses an impressive light gathering ability resulting in bright images. This makes the Leupold SX-1 spotting scope suitable for use in poor light conditions such as dusk and dawn. This spotting scope model is ideal for outdoor activities such as wildlife viewing, bird watching, hunting, etc. The body is secured with a rubberized armor which protects the spotting scope from scratches and dents and makes it shockproof and strong enough for rugged use. Also, this spotting scope can withstand harsh weather conditions due to the use of O-ring seals and nitrogen filling which makes it waterproof as well as fog proof. This spotting scope comes with retractable lens shades and foldable eyecups for easy handling. The field of view stands at 89-47’/27-14′ at 1000 yards. Now that you are aware of what a spotting scope is and the factors you need to consider while purchasing a spotting scope suitable for 1000 yards along with some of the most popular models available on the market, it should be easy for you to figure out the right model for yourself. Keeping in mind the need and the purpose that is buying a spotting scope will help you buy the right spotting scope. The best spotting scope is the one that suits your specific requirements and fits right into your budget. 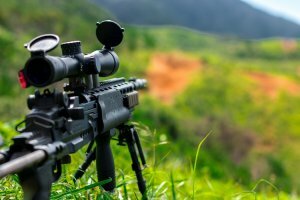 The market is filled with several spotting scopes manufactured by various brands that can be categorized as the best spotting scopes for 100 yards or the best spotting scopes for 200 yards and so on. Make sure that you find the right model which can be touted as one of the best long-range spotting scopes for 1000 yards.